Nice enhancements overall. I am just not very convinced by the greyish button. Maybe white? 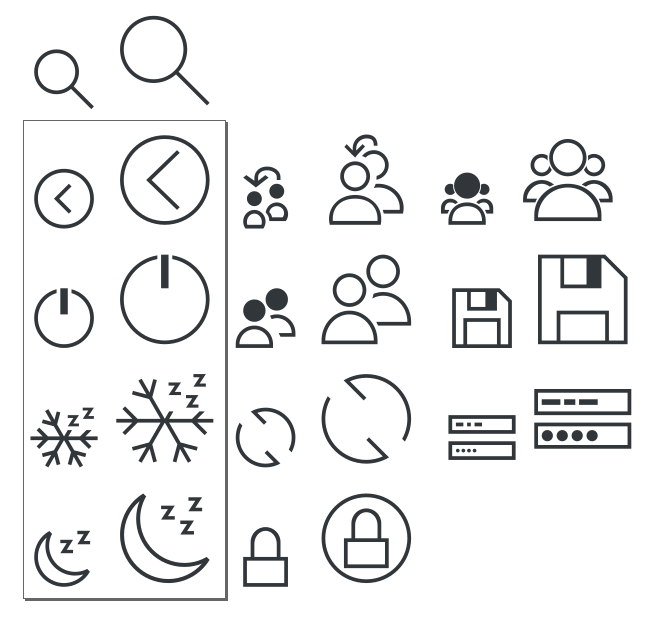 Maybe transparent icons like the others (shutdown, hivernage, suspend, …) for the sake of consistent? All of the buttons will still be white and consistent, it’s just that when you test the login screen in the SDDM tester it does this weird thing of making the first 3 buttons grey/transparent. Login button is too small now. And there was no need to translate, universal “accept” button will be ok.
thanks for the post! have those guys mentioned anything about multiple monitor functionality on lock and login screens? like only a single login area on the default monitor? do you know if those guys are interested in making any multi monitor changes to the login/lock screens? like one login area on the default monitor? individual wallpaper support for each monitor? Nice improvements. Configurable font size is welcome. The large login button has always looked too much like another text entry field, so that’s also a sensible change. I can’t remember the last time I logged in without pressing the enter key, anyway. As long as the login screen is getting so much attention :), I’d like to see a user toggle to disable the fade-out effect. I’d just as soon have all the login icons, password box, etc always visible. I set the screen to turn off if burn-in worries me. Great job! The “Log in” button has always been too long in my opinion, giving an awkward feeling. As an advice, I’d remove the dots in “Other…”, since it gives the idea of a truncated message. Nice changes. Only quibble is the changes to Different/Other User. Icon is not intuitive. Wording oddly turns to ellipses. Makes option unclear. Ellipses indicate that clicking that thing will take you somewhere else where additional user input is immediately required. This is very consistent throughout all of KDE software and I think the reasoning was that it should be consistent here too. I thought it was because the label was too small. User can’t make out what “Other” means. At least “Different User” is clear. Windows’ “Switch user” is very clear. Maybe “Other” should read “Switch” and use the icon with the 2 heads and an arrow point to the other user. It can’t be “Switch” or “Different user” because the main page already allows you to switch to a different user. Wow, this really looks amazing. 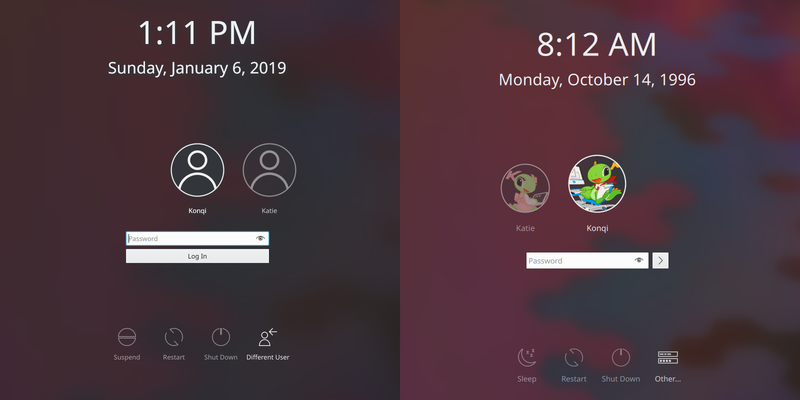 Talking about the Login Screen and all that, i always thought it would be fantastic and rare that being KDE software it is not yet available, to be much more configurable the SDDM screen (the clock that appears there, the date, etc), but in general, terrific improvements, i really feel like this is a huge step ahead, in terms of revamp, renewal, etc. Thank you Krešimir, Filip & of course as always, Nate for this amazing news. Is the useless “OK” button in the logout screen now gone as well? Sally the post doesn’t mention logout screen at all. It is indeed useless and confusing, I prefer the Deepin way for logout screen. > the post doesn’t mention logout screen at all. It does mention it (as early as the headline) but doesn’t show a screenshot. And voila. No more irritating blur. The blur effect is great in a system (I really love it) but not on the SDDM screen. This should have been optional from the startup. Moreover, this SHOULDN’T BE EVEN DEFAULT. People generally hate it so I’m surprised you are so walking on toes around this as if that was some untouchable, holy feature. This was the biggest outcry in many communities after introducing that enhanced blur. The blur on SDDM is a classic example of throwing a baby with the bathwater. There was a one, insignificant issue for a very small number of people and to fix it developers created a massive problem for most of us. This should be a priority. No blur effect fixes will really fix it. Only having easy, GUI way to disable/enable it is the right solution. It already exists in qml so it’s only a matter of adding GUI to switch that qml. Yes, I agree that exposing it as an option would be ideal However right now the Breeze SDDM theme has no options so adding infrastructure to handle them needs to be done first. I believe Filip wants to work on that. Great! Just a bit concerned about how the icon scaling happens immediately and not during the transition as it moves to the middle. I believe it would be a quick fix to adjust this?